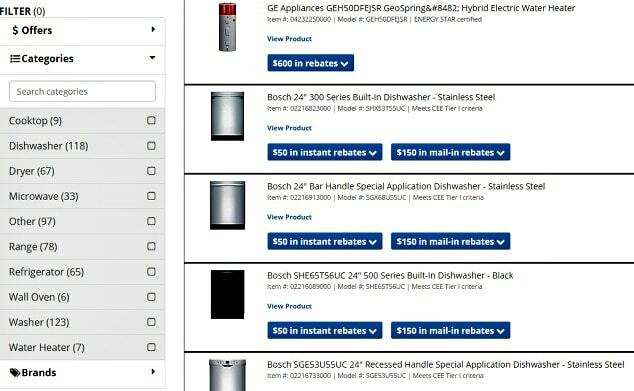 Did you know that Sears has an online rebate center? A smart money saving tip is to check the Sears Rebate Center before you decide on an appliance. If you are looking for the best price and trying to compare several different brands, knowing there is a nice rebate coming your way could help you to make the smartest decision. Click on Categories and search by Cooktops, Dishwashers, Dryers, Microwaves, Ranges, Refrigerators, Wall Ovens, Washers, Water Heaters, and Other. Click on Manufacturer Rebates and find rebates from Bosch, Frigidaire, GE, Kenmore, LG, and Maytag.